So, he visited the border between Laredo, Texas, and Mexico on Thursday to talk about safety and possibly building a border fence, but no one has any idea what the presidential candidate actually said because all anyone could focus on was Donald Trump's hat. The New York businessman is seeking the GOP nomination for president along with about a dozen other candidates, and his derogatory comments about Mexican immigrants, his decision to publicly announce Lindsey Graham's cell phone number, and his social media feud with fugitive drug lord El Chapo are just a few of his campaign highlights (or lowlights) so far. Why Trump decided to cover up his famous head of hair with what looked like a cheap trucker hat he pulled off a department store shelf is anyone's guess (indeed, many on Twitter asked why a guy worth a few billion dollars couldn't spring for a better quality chapeau). Trump's hair is as much a part of his personal brand as his often over-the-top speaking style. The slogan on the hat read "Make America Great Again," and as of this writing, there is nowhere one can purchase one of these hats; apparently Trump is the 1 percent. It was probably a hot day in Texas, so maybe he didn't want to take any chances with getting heat stroke or looking sweaty and hot on camera (one estimate said there were more than 100 journalists trailing Trump during Thursday's event). But it's still sort of funny that Trump wore the hat, because all signs point to the fact that he's pretty vain about his magnificent head of hair, which has been proven more than once to be his real hair, and not a toupee. Because the Internet is sometimes a wonderful place, some creative Photoshoppers worked with the slogan on Trump's hat to make it, as Bloomberg Politics put it, "Trumpier." The results are amazing. Of course, some people took a different tactic and basked in the wonder of The Donald's hat, most of them in either complete awe or surprised admiration. And, naturally, because Twitter can't help itself, there are already several Twitter accounts for Trump's hat. The most prolific one seems to be @TrumpHat. 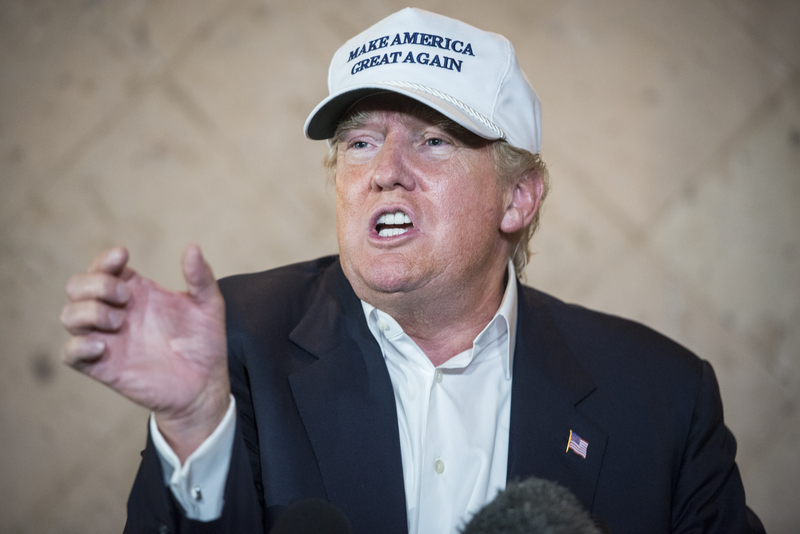 The bottom line is, no matter how catchy the slogan or how well it fits his head, Trump just doesn't do hats all that well. Thursday was not the first time he's tried to cover up those amazing locks. Yeah, no idea what's going on there. Megan Mullally looks fab, though. As for the Donald, he should probably lose the hats and instead, just invest some of those billions of dollars he has in a really good brush and some high-end — dare I say "classy" — hair product.